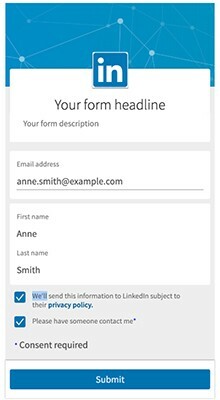 Since launching LinkedIn Lead Gen Forms in 2017, we’ve heard from many advertisers who want more ways to secure permissions from their audience during form submission. In response to that feedback, last year we gave all advertisers the ability to add custom checkboxes to a Lead Gen Form. With a custom checkbox, you can ask people submitting a form for a range of permissions. For example, you can ask prospects to register for your newsletter or give you consent to contact them in the future. You can see an example at the bottom of the image below. Until now, Lead Gen Forms campaigns targeting members in the European Union automatically appeared with a simple checkbox, which many advertisers used to secure member permissions. On March 4, at 12 a.m. Pacific Standard Time, we will disable this automatically applied checkbox and ask advertisers to start using the new, custom version. This offers improved features, like the ability to add multiple checkboxes to a single form and customize the checkbox text. Sign into LinkedIn Campaign Manager at linkedin.com/ads. 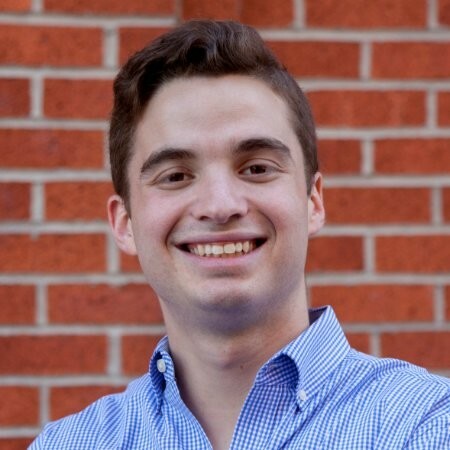 Then follow these steps to begin creating a Lead Gen Form. On the screen where you create your form (near the bottom), you’ll find an option to “Create a checkbox”. Click “+ Add a custom checkbox”. Enter the text that you’d like your campaign audience to see next to your checkbox (up to 500 characters). If you’d like your checkbox to be a requirement for form submission, simply tick the box that says “Required”. If you’d like the checkbox to be optional, leave the “Required” box empty. Optional: If you’d like to add another custom checkbox to the same form, click “+ Add a custom checkbox” again. One form can display up to 5 custom checkboxes. When you’re done creating your form, click “Save”. Your form, complete with a custom checkbox, is now ready to use on a campaign. At this time it is not possible to add a checkbox to an existing Lead Gen Form. You can only add a checkbox to a newly created form. It also is not possible to add a form to a campaign that is already running. 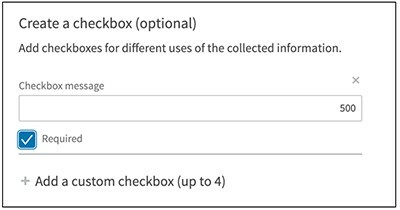 If you want to add a custom checkbox to an existing Lead Gen Form, please duplicate your form and add a checkbox to the new form the during the duplication process. Follow the instructions above. If you want to ensure that your active campaign displays a custom checkbox, please duplicate the active campaign and add the form containing your checkbox to the new campaign during the duplication process. To keep pace with the latest on LinkedIn advertising products, subscribe today to the LinkedIn Marketing Blog.